Portable Bluetooth speakers are a great way of enjoying music on the go and there is a vast array of choices available today that cover all budgets and different sizes. All the speakers mentioned below speakers are wireless and portable, running using battery power rather than needing to be plugged into a mains socket 24/7. In terms of the actual wireless connection, the main technologies to consider when buying are AptX and NFC, NFC helps to pair up a speaker with your mobile phone more easily just by waving it over the NFC sensor, whereas AptX is a higher-quality type of Bluetooth audio codec that offers much improved sound quality when used with the latest aptX-compatible mobile phones and tablets. NFC isn’t really essential as Bluetooth is not difficult to set up, NFC just makes something which is already pretty easy – even easier! But aptX is a must have if you want a Bluetooth speaker with the best sound and will probably be the new standard on all mobile devices. Pure Voca – features a 10-hour battery plus an Aux wired input all housed in a sleek Aluminium shell. Available for under £60 this curvy design looks so good you could easily believe it costs twice the price. Of course at this price there are not many extra features, no NFC or aptX for example, but the sound is great with lots of bass (in fact if anything you may feel there is too much bass, but that’s a minor quibble). For the price the Pure Voca is an obvious speaker system to recommend, basic but good! Cambridge Audio GO V2 – the Cambridge Audio Go was one of the first of the modern crop of decent wireless speakers at a reasonable price. This second version has improved the audio performance and also features a classier design, while adding the latest technologies such as NFC and aptX. It’s not a monstrously loud system, but it sounds very good indeed and has a battery which is capable of up to 18 hours of playtime and costs less than 100. Ministry Of Sound Audio M – this system features aptX, integrated amplifier and Bluetooth, a separate tweeter, touch controls, up to six hours battery life, plus clear and pretty well-balanced sound. You can really tell there’s a separate speaker that handles treble, this is a corker of a speaker for under £150 (or if you opt for the Plus version with Wi-Fi it costs just under £200). Sony SRS-X5 – not exactly well known for budget products, Sony actually makes some of the best-value portable wireless speakers. This SRS-X5 is available for under £100 and it sounds a lot bigger than many more expensive speakers on the market, especially in terms of delivering deliver powerful bass. 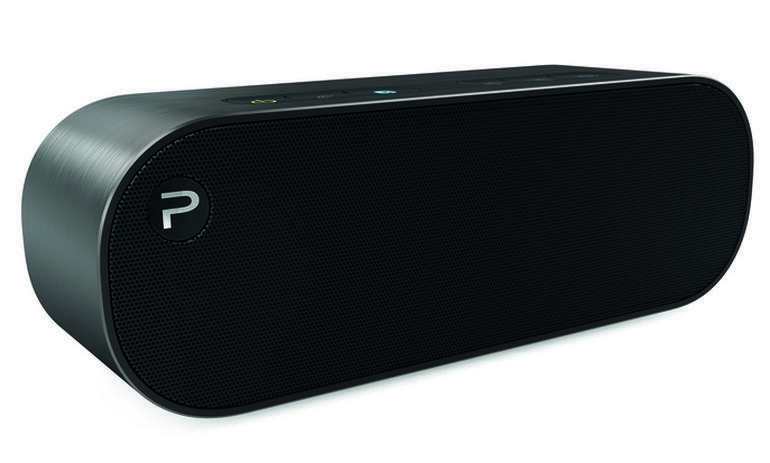 The SRS-X5 features NFC and aptX, 8-hour battery life and multiple programmable sound modes. Bowers & Wilkins T7 – for those who are willing to spend a little more, then the Bowers & Wilkins T7 is a great choice. With double 50mm drivers and aptX support, the T7 sounds great and looks like a luxury item too. You also get a dual passive radiator that provides loads of bass in addition to the crystal clear treble provided by the twin 50mm drivers. Battery life is good too at 18 hours and although the T7 doesn’t come cheap at around £300, it’s a real class act.